MINT HINGED, SG. Nos. 1 - 6. HIGH CAT VALUE, CHEAP AT MY PRICE. BASUTOLAND 1954-58 QEII Definitive Set of 11 SG43-53 in fine unmounted mint condition CV £110. 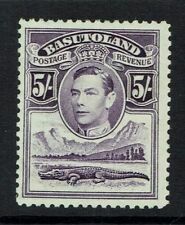 BASUTOLAND KGV Scott 9 SG9 Mint Lightly Hinged 5' crocodile. Catalogue Value £80. 1933 set of 8 to 2s6d SG1-8. Year of issue: 1933. Fine Mtd Mint. Grade: Fine. Occasionally we all make mistakes, and if we do we fix it. Condition: Mint Hinged. Price: £30.00. Era: King George V (1910-1936). Basutoland 1961 QEII complete set of all types of surcharges MNH. SG 58-68b. 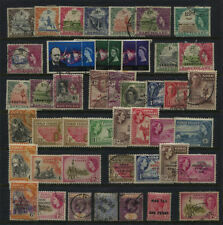 BASUTOLAND SG69/79 1961 DEFINITIVE SET. Basutoland 1961 QEII 1r on 10s black & maroon (Type I surch) MNH. SG 68. Sc 71a. Basutoland 1961 QEII 1r on 10s black & maroon (Type I surch) superb mint never hinged. Gibbons # 68. Scott # 71a. Good shade comparison. Catalogue Reference (Stanley Gibbons 2017): D1, D1a. 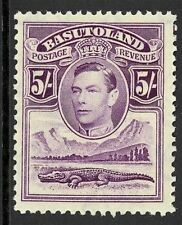 Basutoland collection 96 stamps 3 PAGES! 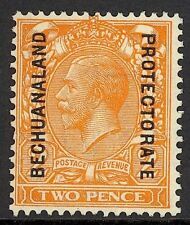 BASUTOLAND SG36-37, COMPLETE SET, NH MINT. Cat £50. RSW. 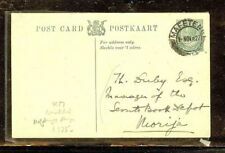 <>BASUTOLAND SGD1a 1938 1d SCARLET POSTAGE DUE. A FINE MINT CORNER BLOCK OF 6 STAMPS, 5 UNMOUNTED. ADDITIONAL CHECKOUT OPTIONS We accept payment by Paypal, Mastercard, Visa and bank Debit Cards. We do not accept payment by other forms of credit card or American Express/Diners Club. We only accept cheques in £ sterling. Payment should be made within 7 days of purchase. Cheques should be payable to: S.Edwards. We combine all your orders in one letter. Basutoland 1961 QEII Decimal Currency set complete in blocks MNH. SG 69-79. Basutoland 1961 QEII Decimal Currency set complete in blocks of four superb mint never hinged. Gibbons # 69-79. Scott # 72-82. Short perforations at base and right side of stamp and pulled corner bottom right. Catalogue Price: £130. 1948 SET(2) BASUTOLAND 1948 SILVER WEDDING UM/MINT SG.36-7. BASUTOLAND GEORGE VI 1948 SILVER WEDDING. VERY FINE MNH. SG 36/7 SET OF TWO. Mint fairly lightly hinged. in good condition. Pages are complete for the period and in nice shape. Includes a couple of duplicate pages. Very Good Clean Condition, hinged to old album page easily removable but nicely displayed. Worldwide £5.00.